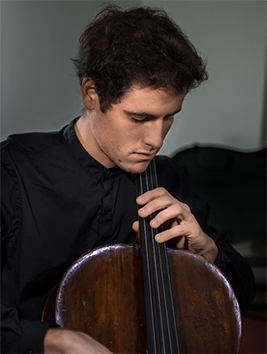 We’re delighted to announce the selection of Carlos Verperinas García, cellist, as the winner of our 2019 Apprentice competition. Following a full day of auditions at St. Cecilia’s Hall in Edinburgh, which featured performances from nine talented young musicians studying at UK music colleges and conservatoires, the Quartet faced a difficult decision, but agreed Carlos was the strongest candidate. “What we as a quartet admire more than anything is a young person sitting down with us and having the strength - and faith in us - to share their vulnerabilities. That is what we try and do ourselves every time that we play together. When Carlos joined us during the audition, we could immediately feel the electricity and love for every single note he played. That made a huge impression on us, and we can't wait to explore our combined voice and discover where we end up”. Tijmen Huisingh, leader of the EQ. Building on the success of the second-ever competition in 2018, which saw the talented violist Oscar Holch join the quartet for performances throughout the year, Carlos will now go on to receive a period of mentoring and rehearsal before a series of appearances with the Quartet. “I feel really happy to have been selected to play with the Edinburgh Quartet. Sharing my passion for chamber music with these excellent musicians will be such invaluable experience for my career”. Carlos studied music at Musikene in The Basque Country, and latterly at the Guildhall School of Music and Drama in London. We are grateful to Creative Scotland, Garfield Weston Foundation, The Hugh Fraser Foundation, The Friends of the Edinburgh Quartet and Dr Jean Keeling for their support of the year-long programme of events.